I noticed The 9 Limited (NCTY) had a parabolic move from 2.4 to about 4.00 a share. On the run there were not any red (negative) days. This is a very good short setup here as today it finally closed red. NCTY is a Chinese company that hasn't had a profit since atleast 2011. 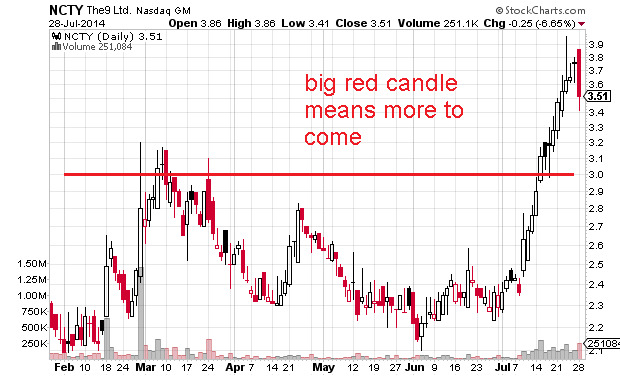 For a target, I see this testing the $3.00 a share area soon. Even as IPOs are soaring and low interest rates are pledged to infinity the major indices are at a major test here. These highs are following the trend breakdown we had back in the spring. That pull-back was pretty significant. Before that the market was in a tight uptrend. Whether the correction in the spring was just a pull-back or the start of a major top will be decided over the next couple weeks. If there's going to be a double top it is going to start very soon. 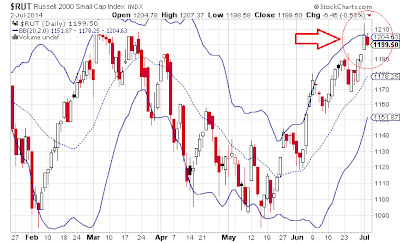 The Nasdaq has printed two days back to back above the upper bollinger band. This is bearish. 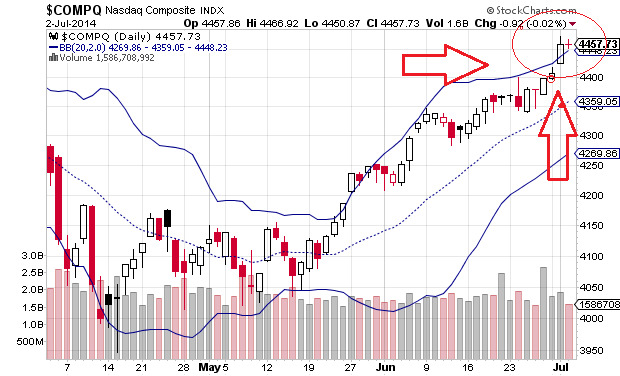 A shooting star candle above the upper bollie is very often the "kiss of death" in technical analysis with stocks. A crashing stock price often follows. 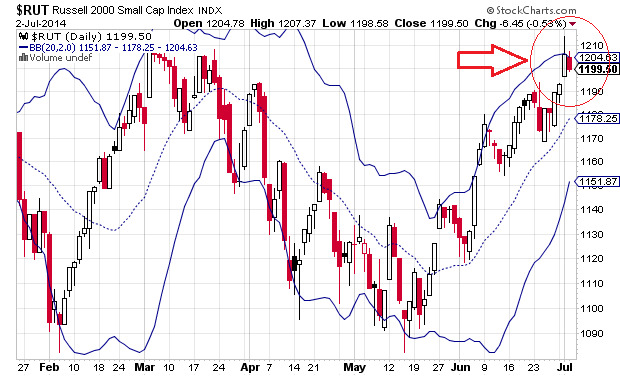 The Russell 2000 index is at resistance and could be topping out. I remember the 2007 Chinese stock market crash began with a double top. I don't think anything here is starting to "crash" as I'm pretty bullish long-term on equites but some major consolidation could be in store. As much as I'd love to see us finally clearly break out of the trading range we have been stuck in since the 2000 Tech bubble crash and 2008 banking panic a runaway market has to consolidate. If this raging bull market is going to stop it is going to begin here. However, if we keep heading higher there is no resistance in sight. So, maybe it's prudent to get some protection on the short-side for a bit. Buy some puts, sell some futures or something and get a little short.